Looks like Felicity Jones' co-star in Star Wars: Rogue One, the upcoming Anthology film from director Garreth Edwards has been found. 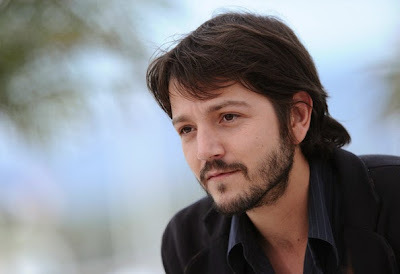 Variety is reporting that Diego Luna (Elysium) has been cast as the male lead to star along side Jones. They also reiterate that Riz Ahmed and Ben Mendelsohn have been cast in the film. Edwards confirmed at Celebration Anaheim that Jones was playing a Rebel Soldier and Variety believes that Luna and Ahmed are also playing Rebel Soldiers, while Mendelsohn will play the film's villain. Variety is one of the most reputable sources when it comes to Hollywood casting rumors, so this information is likely correct (though we won't know for sure until an official announcement is made). As expected Disney and Lucasfilm did not comment on the report. I have to be honest, I'm not all that familiar with Luna's work. Looking through his IMDb it seems he has worked in many roles in both English and Spanish. I will say that so far I am quite happy with the diversity among the cast. Though we only know of one female role thus far (granted that one, it's most likely the lead role, and two, we barely know anything about the rest of the cast beyond the four listed above), we are seeing a an ethnically diverse set of heroes, something the Rebel Alliance was lacking in the films. Same goes for Ben Mendelssohn. A great Australian actor, just now getting his dues with some high profile roles. Things seem to be shaping up well for Rouge One.